Why: How do we even begin to review a book like Les Miserables? Seriously, we’d love some assistance over here. We’ll do our best to express our thoughts, but be forewarned that conflicting opinions are posturing to be heard. The fact that Jean Valjean is our new fiction role model is one matter not up for debate! Providing any kind of comprehensive summary for this novel is far too ambitious for our tastes. Fortunately, all any prospective reader needs to know is that there’s a thief, a police inspector, an ill-treated girl, a lawyer, and all kinds of various miscreants. Against a backdrop of war and revolution the fates of said characters are intertwined to create all kinds of high drama, treachery, and feats of strength. Les Miserables is a beautifully written, epic masterpiece that far exceeded our expectations. Admittedly, we had been dreading this read for several months so the bar was set pretty low. And at 500,000 plus words, we just wanted to survive until the end... Not only did we survive, but we were left with a new appreciation for the history of France and all kinds of weighty social questions to ponder. Les Miserables is a book of despair and second chances. Most importantly, the novel is about the many choices that ultimately define a person’s life. In our opinion the characters were the strongest aspect of the book. There was a good bit about the battle of Waterloo that critics have swooned over, but those parts were overshadowed by the presence of Jean Valjean and Inspector Javert. Both of these characters had the ability to add instant “hold-on-because-something-big-is-about-to-happen” to the plot. Jean Valjean was fascinating and his character provided so much hope for the human spirit. The character of Javier was equally remarkable in his single-mindedness towards order and law, although not quite as likeable. Okay, his likeability hardly registered... but he was still an interesting character. Our only annoyance with Les Miserables was all the tedious digressions littered throughout. We sat through entire chapters dedicated to the appropriateness of slang in literature and the complex, yet often inadequate use of the Paris sewer system. Why do so many “long” novels feel the need to add these sleepy asides? Admittedly, not all the extra bits failed to grab our attention and some of the commentary was actually interesting, especially the few drunken rants that helped set the atmosphere. Still, in the end, we just wanted to get back to the main storyline. Overall, Les Miserables was beautiful and emotional throughout. The end in particular wasn’t rushed and fit nicely with the rest of the novel (this is a big deal for us). We have a new fondness for silver candlesticks and experienced one of the most epic wedding speeches of all time. Now we’re out of breath.... long live Jean Valjean! We thought it might be fun to try out a different meme this Friday... Prepare yourself for TGIF hosted by GReads! 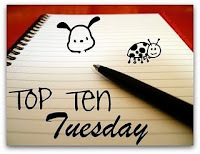 Question: Which genre, authors, or particular books do you think people associate with your reading style? Answer: As much as possible we try to promote equal opportunity reading. One glance at our respective top 25 lists (Evan’s here and Erin’s here) will show that our tastes are truly eclectic. We tend to favor the classics; however we engage in a healthy amount of genre hoping whenever possible. Some of our favorite genres include: historical, fantasy, dystopian, mystery, and countless others that seem to be escaping us at the moment. Don’t forget to check out our very first GRAPHIC REVIEW, which is just as groundbreaking as it is disturbing... Have a great weekend! Why: This novel is classic comedic gold! Given, we’re most likely still basking in the afterglow, but it’s been awhile since uncontrollable laughter spewed forth from our (Evan's) vocal cords during a read. After self diagnosing himself to have every notable medical calamity (other than housemaid’s knee) the narrator received strict orders from his doctor to relax and get some fresh air. It is soon decided that a boat trip down the Thames River is in order. Joined by his two closest friends and dog, the narrator sets out at once. Whether or not the trio actually experience a state of relaxation on their vacation is debatable, however the hilarity of their misadventures is not. 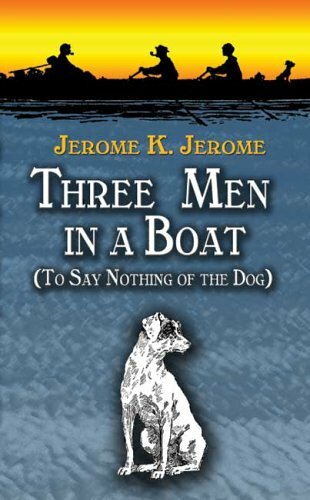 Never would we agree to spend any vacation time with the characters from Three Men in a Boat; however reading about them while on vacation would be quite enjoyable. The narrator’s dry and oblivious manner of capturing the comedic elements within a series of events was masterful. A random incident would suddenly trigger a memory or rant that could go off in any direction. At one point we were reading about how tow-lines have a tendency to self tangle and then several chapters later we learned how inconsiderate Henry VIII and Anne Boleyn were for making out all over England. Honestly, the humor is comparable to the genius of P.G. Wodehouse and we can only imagine what would happen if Bertie Wooster was thrown into the mix. Our only criticism was that the flow was a bit unbalanced (much like the characters) at times. A humorous account of three men trying to construct a canvas above their boat might happen to follow a more somber and detailed account of Magna Carta Island. 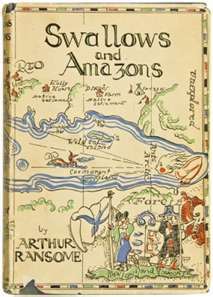 Otherwise, Three Men in a Boat was some of the funniest classical literature we’ve come across. Anytime a novel can solicit laughter on multiple occasions it gets the privilege, nay, honor of receiving our stamp of approval. Editors Note: Contrary to what the above highlighted quote might have you believe; we love our mother-in-laws!!! Question: What’s the LONGEST book you’ve ever read? Answer: According to Wikipedia the longest fiction novel we (Evan) every read was Atlas Shrugged at 645,000 words (1,450ish pages), although A Suitable Boy FELT like the longest book we every read at 591,552 words (1,349 pages). 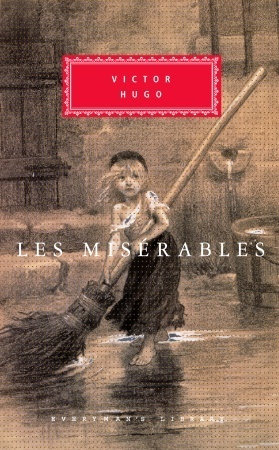 Les Miserables, which we just finished earlier this week was one of the best “long” novels we every read (listened), standing in at 513,000 words (1,350ish). Wow, 3 answers for the price of 1, talk about value. Then again that’s what we’re all about here at Two Bibliomaniacs.... oh, and books. Give us a follow and we’ll be sure to return the favor!!! The novel begins with a fair amount of rejoicing over the birth of Titus Groan, aka, the new heir to the Gormenghast throne. However, young Titus quickly fades into oblivion to make way for more sinister happening at the castle and for a young kitchen servant named Steerpike. The ambitious teen has visions of grandeur and immediately puts plans in motion to increase his relevance. By the time young Titus is ready for his coronation, the stage is set for a battle of power and greed and deceit all against the backdrop of a really, really, really big castle. 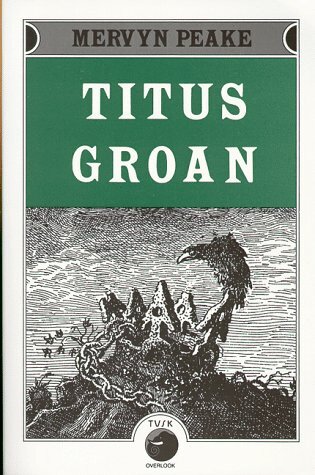 Okay, Titus Groan wasn’t as bad as the opening illustration portrayed (yes, we have a flair for the dramatics), but it was far too slow and wordy for our tastes in fantasy novels. The other problem was the setting. For whatever reason we had a difficult time visualizing the castle, which is strange considering half the novel is devoted to its description. We appreciate the fact that Gormenghast Castle is flippin huge, but we couldn’t seem to get our imagination around the more intimate details. Maybe we need to brush up on our castle vernacular... To add to our dissatisfaction, we were quite appalled by a certain event that had a very negative outcome on the castle’s impressive library... Book violence is unacceptable!!! It would be unfair not to briefly mention the impressive writing (when it wasn’t impressively descriptive) and the fact that we did enjoy the cast. Steerpike, Flay, and Lord Sepulchrave were all interesting and charismatic despite one of them being directly involved in the aforementioned library incident. Yep, we’re still a bit raw. There’s also a pair of twin sisters that bring a fair amount of intrigue and creepiness to the table. In the end, we must get over our less than enthusiastic feelings because it’s full speed ahead... Gormenghast appears in TRILOGY form at number 84 on the BBC big read. We WILL triumph over this entire list... someday! "The old tale of Sleeping Beauty might end happily in French or English, but he was in Russia, and only a fool would want to live through the Russian version of any fairy tale." 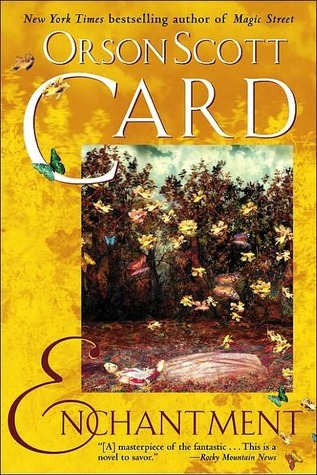 This was our second experience with Mr. Card and following a novel as successful as Ender’s Game we didn’t know what to expect. What we got was not at all what we expected yet in the end our experience exceeded expectations. Make sense? The bottom line: Enchantment is a highly intelligent fairy tale. Philosophy, morality, cultural differences, and folklore all collide in this fun and exciting adventure. Honestly, it felt a tad like Outlander. Although, we really didn’t like Outlander (backlash expected) and we did like this novel, so maybe this is a bad comparison. We’re kind of all over the place with this review, but one of the features we enjoyed the most was seeing someone from our time period (assuming you’ve spent a majority of your life in the 21st century) experience Medieval living and vice versa. The reactions to each society felt real as did the frustrations and adjustments each character was forced to make. We also enjoyed reading about the communication difficulties between Ivan and Katerina, which felt true for anyone trying to manage a relationship that spans across several centuries. We’re still stuck on review number 2, although we did complete The Help read and are anxiously awaiting the movie release. Hopefully we’ll be able to make some better progress in August!!! Be sure to include any of your recent reviews in the below Linky! Statistically speaking, July resulted in the lightest reading month of the year. As we typically like to pass blame onto others, we’ll highlight Jean Valjean as the primary reason for our weak stats. Les Misérables is a monster of a book (although quite enjoyable so far) that took us half the year to finally work up the courage to start. Jean Valjean might also be to blame for a light August. With titles like The Woman in White, The Help, Radical, and The Phantom of the Opera July was a worthy reading month. The jury’s still out on Rabbit, Run (possibly for awhile) though Northanger Abby was a delightful read. As we look ahead to August, there is reason for considerable enthusiasm. Something Rotten, One Hundred Years of Solitude, A Pale View of Hills, Three Men in a Boat, and Pippi Longstocking should provide us with a banner month! How’s everyone else doing in their 2011 reading endeavors? Send us a link so we can check out your progress!